No hairstyle has raised more eyebrows and generated as much curiosity as the dreadlocks. Popularized by the Rastafarians, dreadlocks have come to attain quite a niche fashion quotient off late. Contrary to what most people think, growing dreadlocks is no dreaded affair. You don’t have to fritter away your economic resources at salons to grow dreadlocks any longer. It can be done at home following some simple techniques. All you have to do is to implement some techniques with certain degree of caution and precision. Dreadlocking doesn’t take years nor does it requires a special hair type. By using a few simple techniques and products, you can very easily grow beautiful, clean dreadlocks in just a few months. Even if the salon method is the fastest way to achieve the locks, not all salon methods are 100% natural. Also, dreadlock perms alter the hair’s texture until they grow out. You can grow dreadlocks in different ways, a few of which are comb coils, palm rolls, two-strand twist and three-strand twist. While comb coil is best for short length hair, palms rolls work fine for longer hair. The two-strand and three-strand twists, on the other hand, can be used on all lengths of hair. Listed below are some of the best techniques to grow dreadlocks naturally. There are several ways, choose of your own volition and adorn your hair with dreadlocks. Dread perming is an expensive and unhealthy process, which involves applying chemicals to the hair to create instant dreadlocks. It is extremely harmful to your hair and is unwise to consider this method as one of the options to grow instant dreadlocks. Wool hat rubbing is one of the most widely used methods to grow dreadlocks, as it is free and natural. This method saves hair from being jeopardized, by the application of chemicals as used in dread perming. However, it is a painful process that can only be attempted on the hair once. If it fails to produce the desired result, before trying it, your hair should be cut and re-grown. As you rub your hair with the woolen item, your hair will begin to knot and it is up to you to pull apart these knotted sections of hair and rub them again to form knotted dreads across your head. It may not be particularly healthy method for dread growing dreadlocks, as it can severely damage the hair and is severely painful. Part a section of your hair. Apply locking gel to the section. The section of hair that you twist should be small. As locks mature, they will get thicker. Also, keep in mind how big do you want to make your locks appear before making any decision. Comb that section of hair and stop when the comb is midway. Use the comb to twist the section of hair. Twist the comb around making a tight coil in that section of hair. Twist the comb and pull it down slowly through the section of hair. When the comb is completely out of the section, the hair should be in a tight coil. Repeat this method on all your hair. Section some of your hair. Then apply locking gel to the section. Put your palms together with the section of hair between them. Push one hand up and the other one down so that the section of hair is rolled. This will create a coil in the hair. Continue this technique until the entire section is tightly coiled. Repeat on all of your hair. Section a piece of hair. Apply locking gel to the section. Divide the section into two strands. Twist these two strands together one over the other until you get to the end. Repeat on all of your hair. Divide the section into three strands. Anchoring the center strand, keep twisting the two outside strands around it the same direction. It’s like the two outer strands are chasing each other. Do this until you reach the end of the section. Repeat the process throughout your hair. 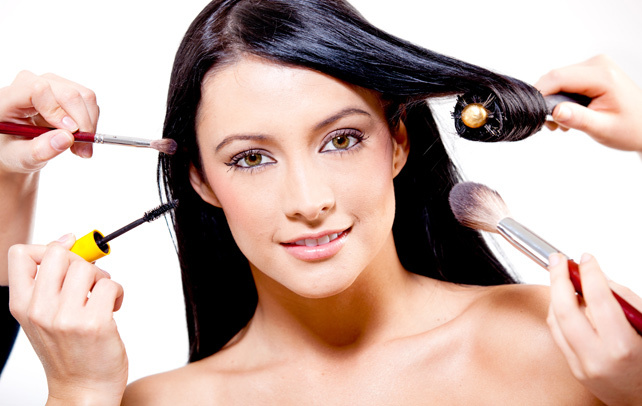 You must make sure to use a product in your locks, which doesn’t cause a lot of buildup. Products, which are too thick and heavy stay in your locks and make them appear dirty. Don’t use products that contain beeswax. It is very important that you shampoo your hair regularly so that your dreadlocks remain clean and soft. After you shampoo your hair, apply whatever products you have decided to use. Oil your hair regularly as it keeps hair from drying out and apply gel so that dreadlocks hold in. Make sure to twist the root to keep them tight. If your locks are still new, you will have to twist the base of each lock after washing your hair and clip the base to hold the twist tight until the locks dry. Dreadlocks are now quite a fashion. They can be quite easily grown at home using the above-mentioned techniques. It is always advisable to adopt natural ways to grow dreadlocks so that you don’t call upon any harm on your hair. Use of chemicals and other artificial methods must be avoided as dreadlocks can quite easily be attained at home absolutely naturally. Growing dreadlocks is not the end of the task. They have to be maintained. Maintenance also involves a good deal of care, which must be taken care of in order to have lasting and clean dreadlocks.